I really like this week lists. 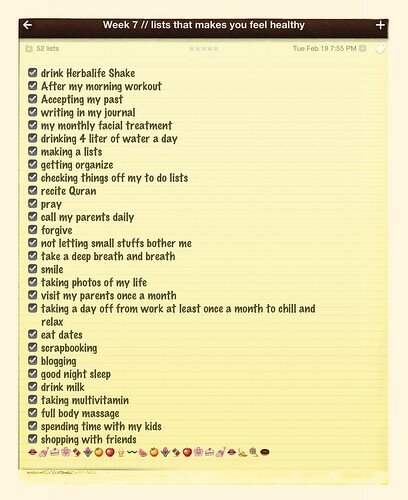 It really helps me to keep track of all the things that I do to feel healthy. The 52 lists is a project hosted by Moorea Seal. This is one of many ways you can document your life , by using lists. Every week she will post a prompt and a downloadable PDF list above to write on. If you post about it on Twitter, Instagram, your blog, or Pinterest, then stop at her blog and link up your list.